Following an acclaimed run at the Liverpool Playhouse Studio, Lizzie Nunnery’s NARVIK embarks on a national tour as part of Box of Tricks’ tenth anniversary season. The poetic voyage through war, love and loss received critical acclaim when it premiered back in 2015, gaining four star reviews from both The Guardian and the Liverpool Echo. Ahead of its opening at Manchester’s HOME, Frankly My Dear UK’s Donna Kelly caught up with Box of Trick’s Joint Artistic Director Hannah Tyrrell-Pinder. Tyrrell-Pinder commissioned the project back in 2012 after collaborating with award-winning playwright Lizzie Nunnery on an installation performance piece at the Everyman festival. The pair quickly became friends but it was only when Tyrrell-Pinder went to watch Nunnery and her husband Vidar Norheim perform at a live music event that the idea for NARVIK started to take form. “I’d long been interested in finding a way to merge music and text and then Lizzie came along” explains Tyrrell-Pinder. Set during the Second World War, NARVIK brings to life a powerful story of love, guilt, heroism and betrayal. It tells the story of a Jim, a 90-year-old man who, after suffering a fall at home, drifts through recollections of a naval campaign and a long-lost romance with Else, a beguilingly free-spirited schoolteacher from Oslo. The story was inspired by Nunnery’s late grandfather, who used to share reminiscences about serving in the Royal Navy’s little-chronicled Nordic campaign during World War II. “When we were originally talking about it, it was going to be very autobiographical but then we moved totally away from that and created a totally fictional piece that was just inspired by facts” explains Tyrrell-Pinder. What makes NARVIK so special is the way music and sound is used within the piece. The piece fuses live folk music and writing to create a patchwork of memory and dreams. In the original production, Nunnery and co-composers Vidar Norheim and Martin Heslop also donned ratings uniforms and engine room boiler suits to appear as part of the instrument-wielding Greek chorus, although Nunnery herself is not appearing in the touring production. “Music is played virtually throughout the whole piece but it’s played using bits of the set” explains Tyrrell-Pinder. 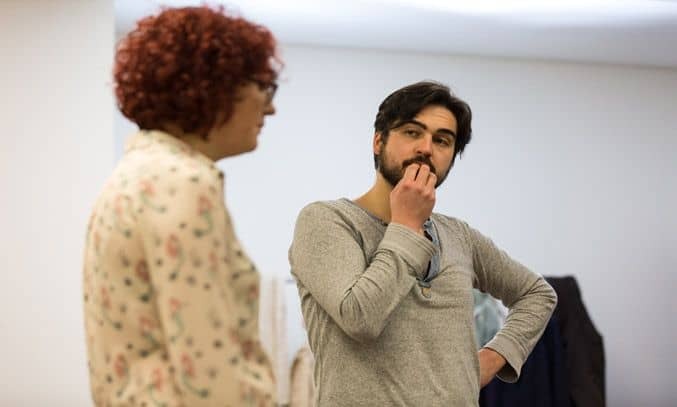 It’s been over a year since the play first premiered at the Liverpool Playhouse Studio in September 2015 but the Manchester-based director is relishing the prospect of getting back under the skin of the project. While premise of the play remains unchanged, those who saw the original production in Liverpool in 2015 will notice a few subtle differences to the script and set. “Lizzie has changed some bits and added some bits” explains Tyrrell-Pinder. Yet despite the 17 month break between the initial run and the tour, Tyrrell-Pinder is not surprised that the play has been given a second lease of life. “We kind of knew from the off that it should have a further life and actually the success of the initial run justified that belief on our parts” comments Tyrrell-Pinder. More importantly, Tyrrell-Pinder hopes the tour will attract a variety of new audiences, particularly live music fans who typically don’t attend the theatre. “I kind of hope that we’ll get audiences in who are music lovers who come to take a risk on a piece of theatre because they love live music. Hopefully from their experience, they’ll think that coming to the theatre isn’t that different from going to a gig and there is still the same level of storytelling and engagement” explains Tyrrell-Pinder. 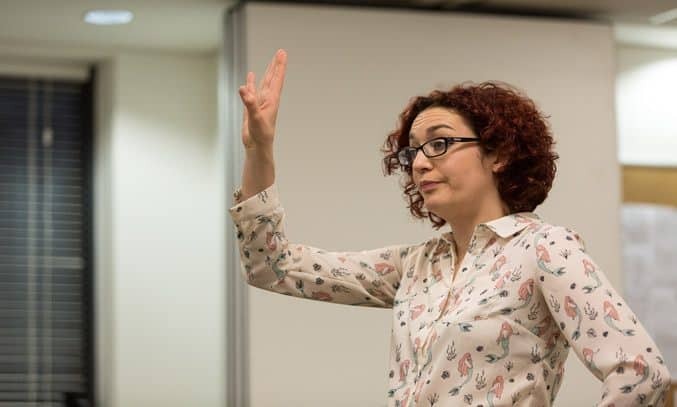 “But actually in terms of the story, my hope – which is my hope for every piece of theatre that I put on – is that people will look at it and look at the story and apply the experiences to their own life. It’s turning that fiction and story in on yourself and using that as a mirror to enrich your own experience”. NARVIK opens at Manchester’s HOME on 31 January before embarking on a UK tour until 25 March 2017.